Global Finance announces the "World's 50 Safest Banks 2009"
With bank stability still high on corporate and investor agendas, Global Finance magazine publishes in the October 2009 issue its annual list of the world’s safest banks. Global Finance has published its world’s safest banks listing for 18 years. This ranking is a recognized and trusted standard of creditworthiness for the entire financial world. The “World’s 50 Safest Banks” were selected through a comparison of the long-term credit ratings and total assets of the 500 largest banks around the world. 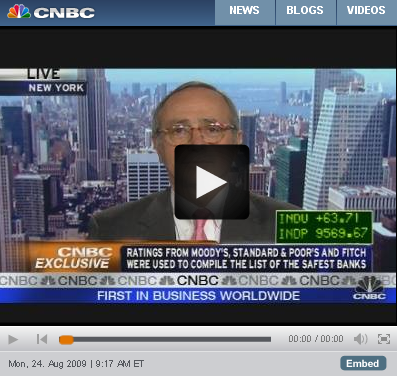 Ratings from Moody’s, Standard & Poor’s and Fitch were used . The World's Safest Banks 2009 Ranking.